A prototype of an aluminum foil boat before being put into water or weight added. ENGINEERING – Try this experiment that can be used for science, engineering, or technology, or computer science. This task is a common introductory, team building, or instant invention activity used across many grade levels. An emphasis on science and engineering practices, critical thinking skills, and team building process skills is appropriate when used in this manner. This lesson is from a computer science curriculum, but is applicable to any curriculum for introducing the importance of teamwork and problem solving and training students in classroom procedures. The aluminum boats problem could easily be substituted out for any number of other problems that require students to define their goals, devise a plan, try a solution, evaluate their results, and then iteratively improve. The problem chosen is intentionally “non-computational” and helps to frame it as one about problem-solving more generally with computer science being a new “tool” to help attack certain types of problems. Scroll to the bottom to find out how other teachers adapted this lesson for their classrooms. Group: Put students in groups of 2 or 3. Distribute: One copy of the Aluminum Boats Student Activity Guide to each group. As a class, read through the Goal and Rules sections of the activity guide and answer questions. Support: Give students a couple minutes to discuss in groups the approach they will take with this first boat. Once groups have recorded their ideas and some possible weaknesses, they can come to you to get their aluminum foil and begin building their boats. 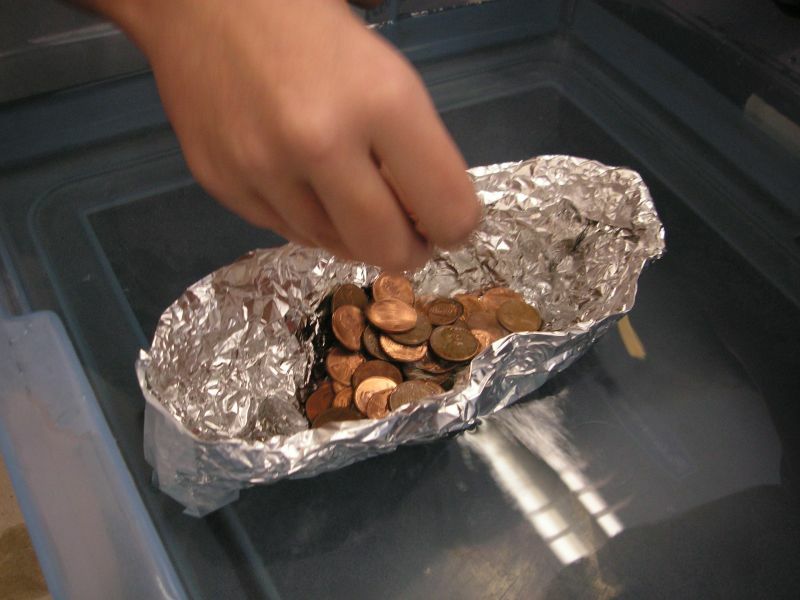 A student drops pennies into her boat one at a time to see whether it will continue floating. Once groups are ready, have them test their boats by dropping individual pennies into the boat. Remind them of the rules, specifically that they can’t touch or adjust the boats once they’re in the water. Have them record the total number of pennies held on their activity guides. Share: Have students share the results of their first run with neighboring groups. Ask groups to focus particularly on what the eventual failure of their boat was (e.g. it wasn’t deep enough, it was unstable, etc.) and brainstorm ways to get around those problems. Prompt: Now that you’ve had a chance to learn from the first round of boatmaking, let’s run the same activity again. First, your group will develop a new plan. Just as before, record it on your activity guide, and once you’re ready I’ll come around and give you a new piece of foil. Once groups have prepared their new plans give them a new piece of foil and have them each build a new boat. Groups can test their designs just as before and record the results on their activity guides. Transition: Ask class to return to their own seats to reflect on the activity. Prompt: What was your favorite part of this activity? What was most challenging? Discuss: Allow students time to share thoughts with the class. Discussion Goal – This should be a fairly open-ended discussion of the different components of the activity. Feel free to ask follow up questions if you like but the main goal is just to kick off the later conversation. Prompt: Since you are in a computer science class, you also may be wondering, “What in the world did that have to do with computer science?” Find another partner and talk about what you think this activity has to do with computer science. Discuss: Allow students an opportunity to share their responses with the class. Discussion Goal – The second question will give you a chance to hear some of the thoughts and beliefs students have about computer science. Students may suggest things like, teamwork, sharing ideas, making improvements, etc. Again, the goal is not to agree or disagree, but to foster an environment to share those thoughts. It is appropriate to ask follow up questions that are not threatening, such as, “explain that thought to me more”. Although there are no right or wrong answers for this discussion, for our purposes, the main point is that students solved a problem. They had to define the problem, plan a solution, try a solution, and evaluate it. This activity can get your room wet! Ideally, each group should have its own bucket/container with water to conduct its own tests. If needed, you can have several groups share one container, but be mindful to set guidelines for sharing that container. Place towel/rag under each container. You may also want to consider having this activity in the hallway or some other space if your room is very restrictive. Hold onto the foil until students submit a plan for their boat. The goal isn’t to slow them down too much, but just give them a moment to reflect briefly on the possible approaches they could take. While some students will view this portion as a competition, emphasize that each group is looking to improve its own design, not competing against others. You are appealing for each student to challenge themselves first, not others. STEM Boat Challenge – View how Timothy Baszak used this lesson in his STEM class for grades 5-8 at Waypoint Academy. ETS1 3-5-ETS1-2. Generate and compare multiple possible solutions to a problem based on how well each is likely to meet the criteria and constraints of the problem. 3-5-ETS1-3. Plan and carry out fair tests in which variables are controlled and failure points are considered to identify aspects of a model or prototype that can be improved. MS-ETS1-2. Evaluate competing design solutions using a systematic process to determine how well they meet the criteria and constraints of the problem. MS-ETS1-3. Analyze data from tests to determine similarities and differences among several design solutions to identify the best characteristics of each that can be combined into a new solution to better meet the criteria for success. HS-ETS1-2. Design a solution to a complex real-world problem by breaking it down into smaller, more manageable problems that can be solved through engineering. WHST.6-8.2a Write informative/explanatory texts, including the narration of historical events, scientific procedures/ experiments, or technical processes. Introduce a topic clearly, previewing what is to follow; organize ideas, concepts, and information into broader categories as appropriate to achieving purpose; include formatting (e.g., headings), graphics (e.g., charts, tables), and multimedia when useful to aiding comprehension. WHST.9-10.2a Write informative/explanatory texts, including the narration of historical events, scientific procedures/ experiments, or technical processes. a. Introduce a topic and organize ideas, concepts, and information to make important connections and distinctions; include formatting (e.g., headings), graphics (e.g., figures, tables), and multimedia when useful to aiding comprehension. WHST.11-12.2a Write informative/explanatory texts, including the narration of historical events, scientific procedures/ experiments, or technical processes. Introduce a topic and organize complex ideas, concepts, and information so that each new element builds on that which precedes it to create a unified whole; include formatting (e.g., headings), graphics (e.g., figures, tables), and multimedia when useful to aiding comprehension.